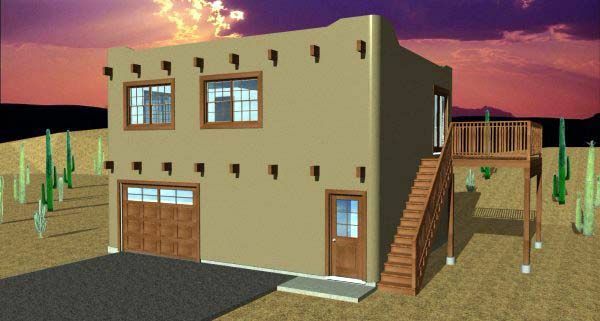 Southwestern properties are the beautiful result of Spanish and American Colonial styles fusing together. 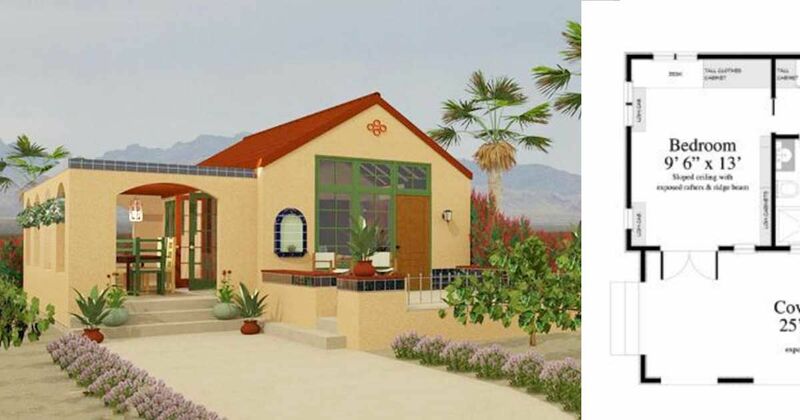 Perfectly suited for the climate of California and the desert, the buildings draw on typical Mediterranean details to maximize the indoor / outdoor space. 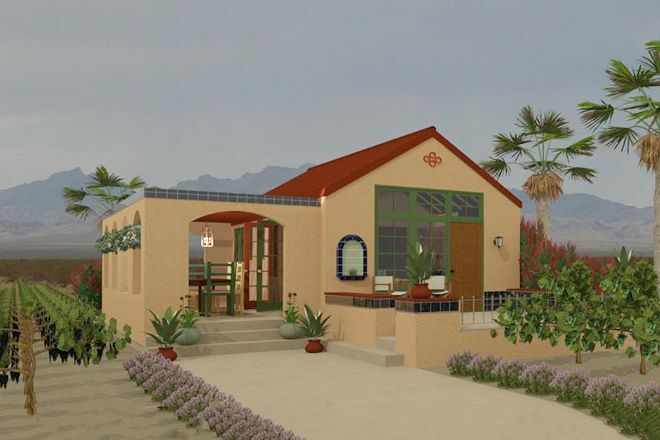 With large airy interiors to keep things cool, verandahs and covered terraces for outdoor living and huge, light-filled windows, Southwestern-style houses are always a delight for the eyes. With the architectural details typical of this style distilled into a delightful tiny home, this property from Houseplans measures 398 square feet (37 square meters). 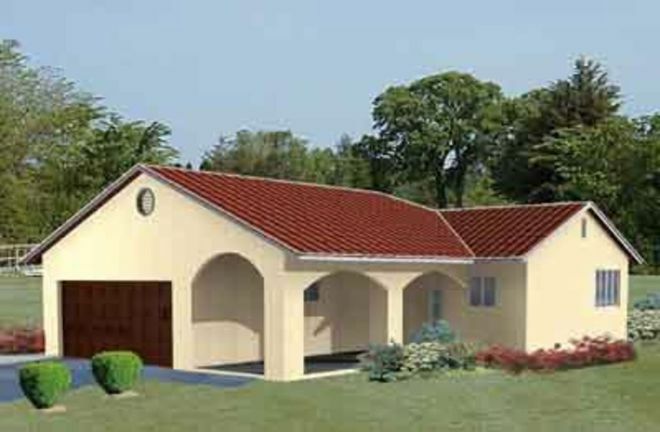 A large covered porch runs the length of the building, with doors to both the open-plan living, dining and kitchen room and the double bedroom. 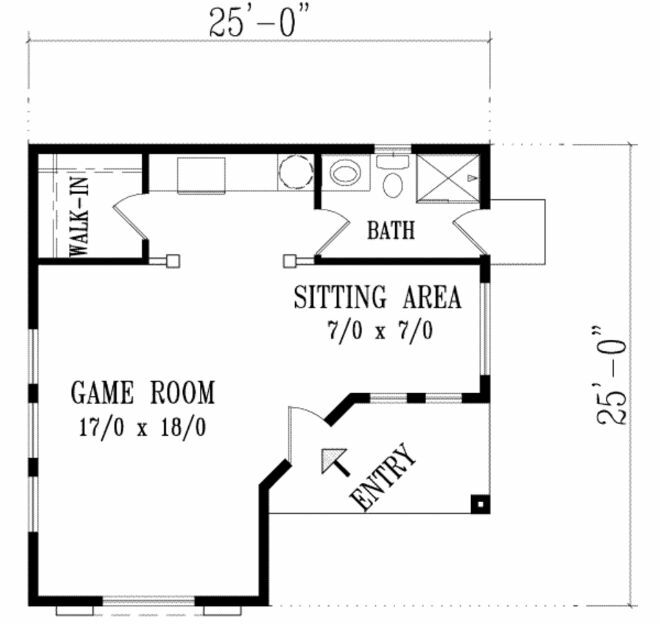 A full bathroom divides the house in two, with a laundry room also in place. A separate patio at the side of the house is an ideal spot for a BBQ with friends after a long day. 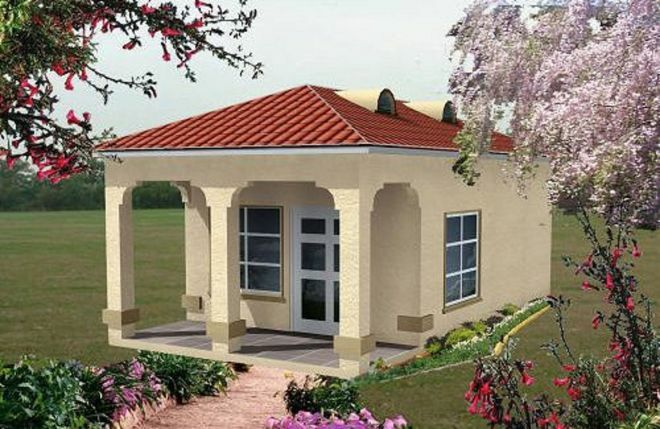 Requiring a little bit of vision to modify the original plans to add a bathroom to the layout, this stylish build from Eplans measures in at 550 square feet (51 square meters). 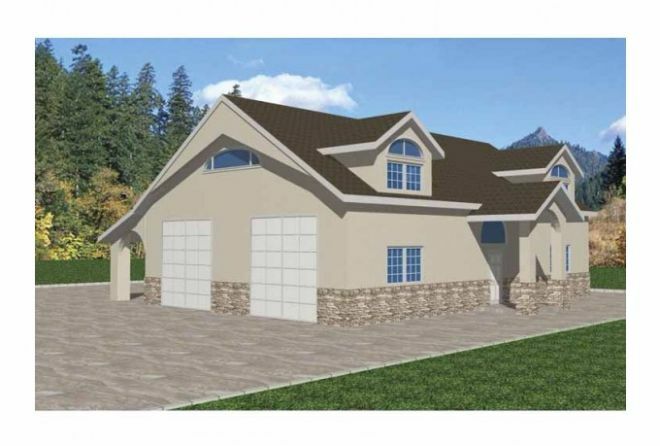 Replace the garage doors with floor-to-ceiling windows and enjoy a large open-plan living, dining and kitchen space straight from the covered entryway. 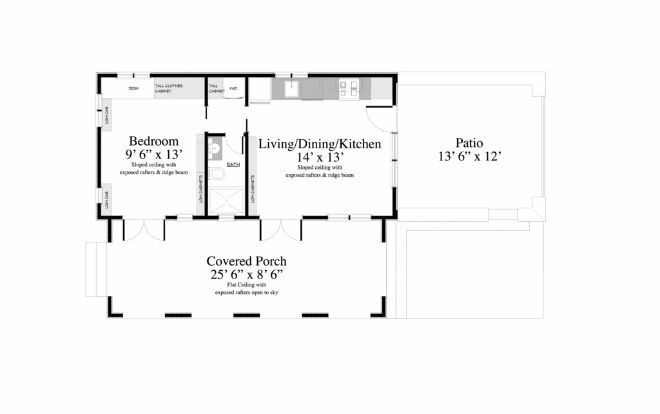 The plans already have plumbing for the half-bathroom included, with space at the back for a guest room or study looking out over the covered decking area. Upstairs, the master bedroom makes use of dormer windows for lots of natural light and alcoves for built-in closets. 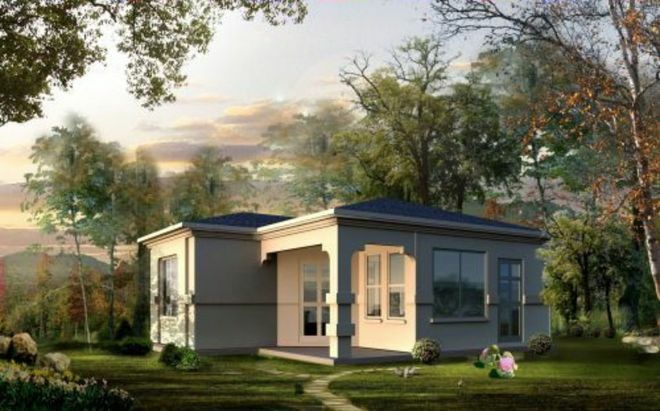 A great home for a single person with a busy life, this Houseplans design comes in at 346 square feet (32 square meters). A patio with Spanish-style arches is a great place to sit outside come the evening time. Inside, an open-plan layout can be adapted to suit a living, dining and kitchen space with a Murphy bed and a fully outfitted kitchen unit. A full bathroom sits at the side of the property, with a large walk-in storage closet. 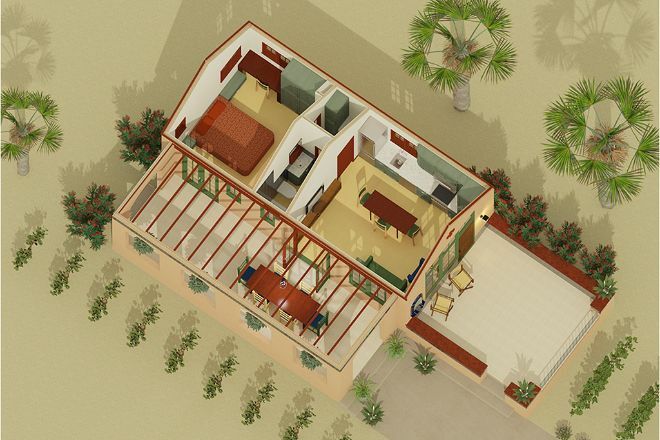 A fantastic build with the opportunity to customize the plans, available from Houseplans. The build comes in at 504 square feet (47 square meters) and would suit an individual or a couple with an active social life. Enter to a large open-plan space, which requires a kitchen to be set in the 'sitting area' to incorporate the plumbing. A full bathroom at the back of the property is also accessible from outside, making it a combination mudroom if desired as well. 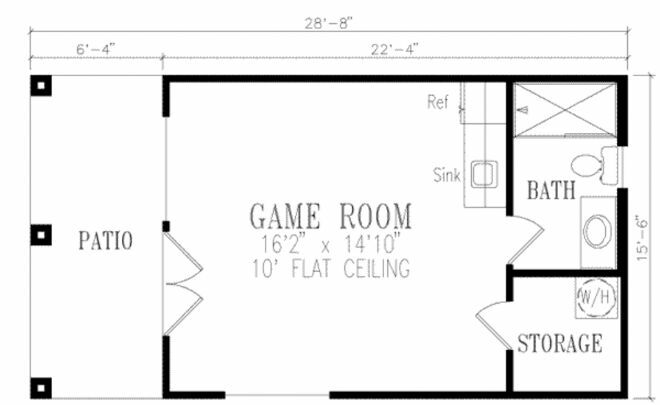 A laundry area at the top of the property could be modified into a Murphy bed sleeping area, with access to a large walk-in closet. A multi-functional space ideal for an individual or a couple, this Family Home Plans design measures in at 732 square feet (68 square meters). 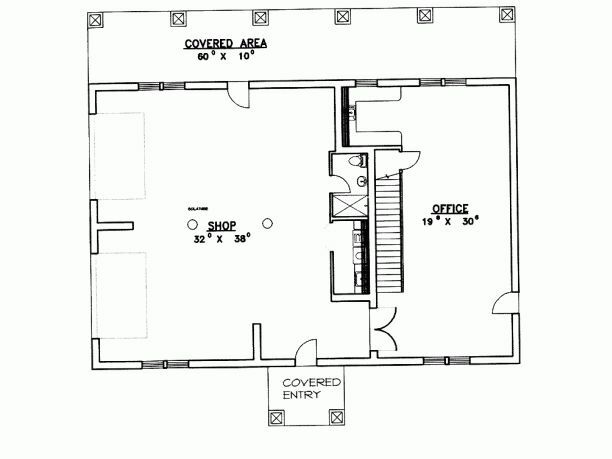 On the ground floor, a single-car garage sits side by side with extra storage space and a workshop for home projects. 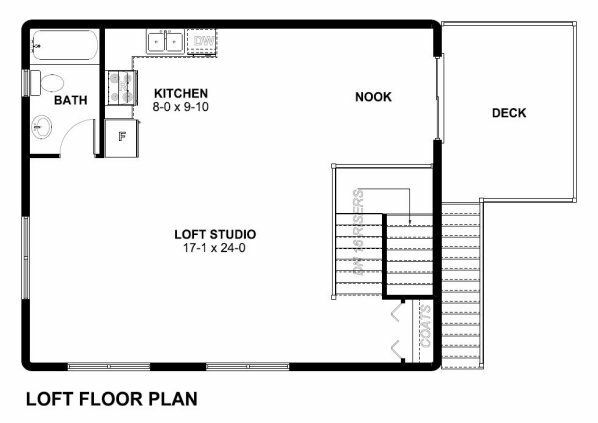 Upstairs, the loft studio boasts a spacious open-plan living area with a kitchen and dining nook that looks out over the outside decking area. A full bathroom is tucked away behind the kitchen. A sofa or Murphy bed could be placed anywhere within the main space to create a sleeping area. 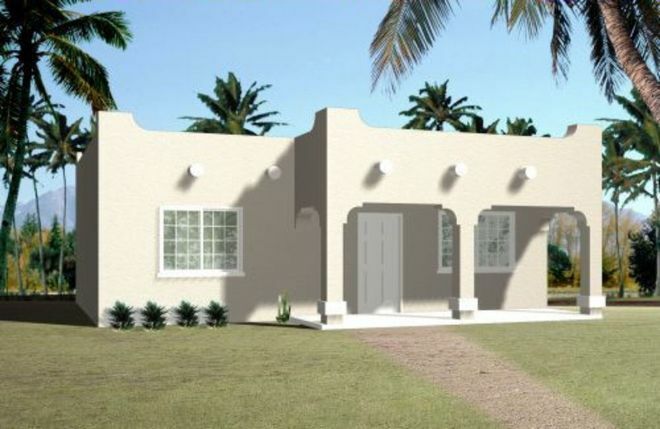 A typical Spanish-style design, this property from Houseplans measures 984 square feet (91 square meters) and is ideal for a small family or a couple. 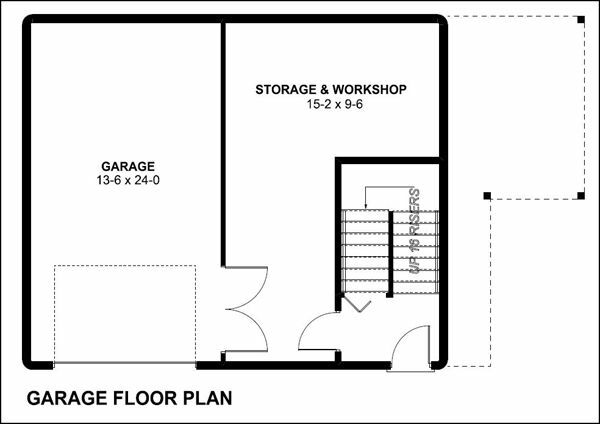 With a two-car garage, there is plenty of extra storage space available as well as a utility room. You can enter the house proper through either the garage or from the arched and covered porch. A foyer with built-in closet leads to an open-plan kitchen, living and dining room with views out to the back of the property. 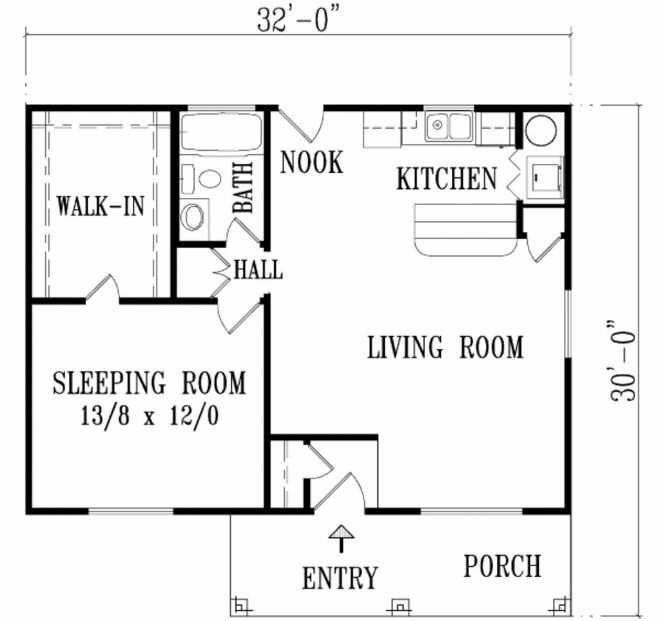 Two bedrooms make up the remainder of the layout, each with access to a bathroom and built-in closets. 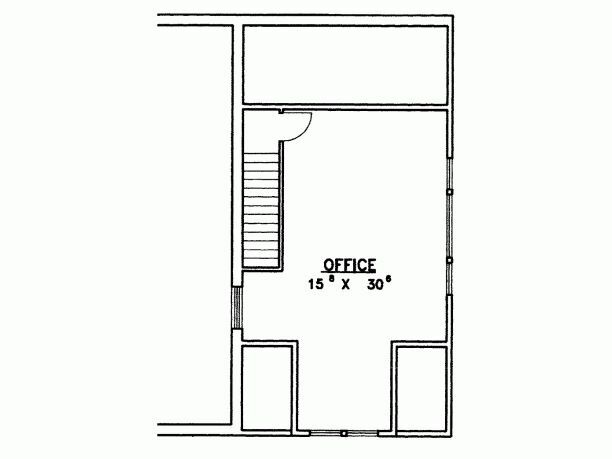 This 768 square feet (71 square meters) property from Houseplans would suit a couple downsizing perfectly. 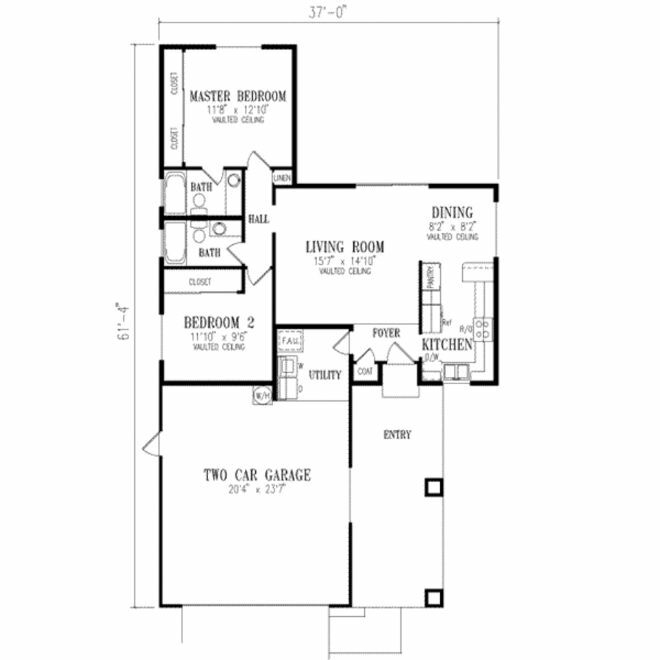 Enter from the stylized arched porch to an open-plan living, dining and kitchen room. Built-in cupboards and a utility closet keep the interior tidy. A small hallway to the side of the main living space allows access to the full bathroom and the double bedroom, with huge walk-in wardrobe.